This image shows forest clearing operations at the upper left and corn farming in the foreground. In the background are palm oil plantations and the port city of Abidjan, Cote d'Ivoire. Today I delivered a completed custom diorama to a representative of AgriSmart Inc. AgriSmart Inc. commissioned me to build a diorama depicting their current and planned operations in Cote d'Ivoire. AgriSmart Inc is new venture that seeks to help farmers in the Cote d'Ivoire develop farming techniques using sustainable methods and excellent working conditions for its people. Thus I was happy to build this diorama for them even though the schedule was tight. The challenge of the project was to show the scope of their operations across much of the country with enough detail to highlight what AgriSmart Inc is planning. To do this the model became more of an artist's concept than a fine scale model. This is not the normal kind of project I do, but it was a challenge and fun to take it on. 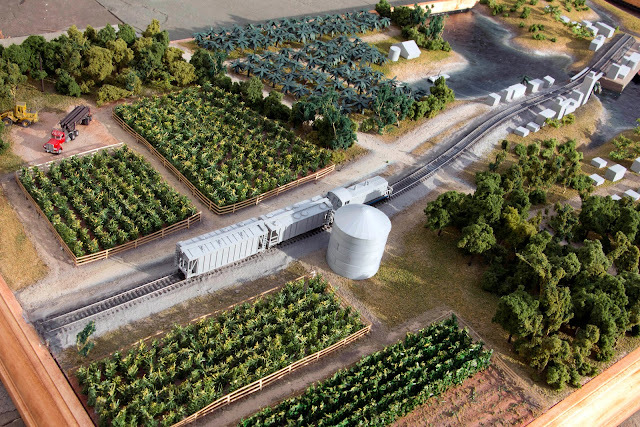 The model depicts corn and palm oil agriculture using modern technology and techniques. 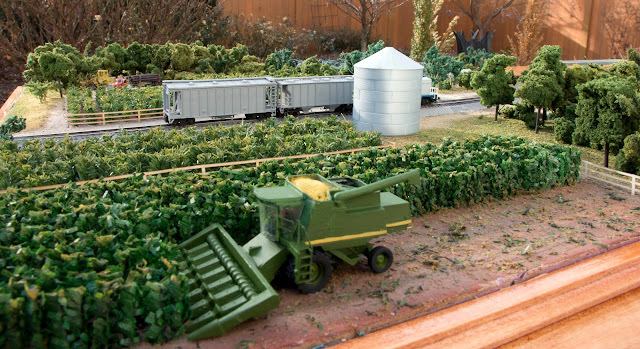 The model has no actual scale, though many of the corn farming operations are shown using N scale models. To depict the corn plants I used some miniature Christmas wreath material. I made the palm trees one by one with laser cut paper fronds on toothpicks. The barge will carry palm oil from the pressing facility to the port. The port city of Abidjan, a city of 5 million people with thousands of building and streets, was especially tricky to depict. We settled on a very stylized representation that shows the general layout of the operation without too much detail. The city buildings are laser cut with some window detail, but are painted plain grey to deflect attention. All of AgriSmarts's operations are painted in brighter colors to highlight them. And, we are proud to say, we delivered the model on their tight schedule and on budget! Combine working on a corn field. The combine is a GHQ kit. where everyone loves to stand! Marty McGuirk gave me a ride home from work tonight. He came down to the basement to see the projects under way. We discussed various topics including DCC problems. He is switching to NCE from Easy DCC. I agreed to buy one of his boosters but not until after bashing my head on a protruding piece of wood under my layout while looking at wires. Ouch. With Marty's booster, I will have a total of 3 for the layout. We also discussed plans for how he could fit White River Junction in an expansion of his layout. But I'll let him discuss that on his blog. I had looked at designs in the past that moved Falmouth out of the narrow part of the front room and to crew lounge. For example see this post. But I took another look after Marty left. My experience with putting a track for PoLA under the stairs convinced me that anything but a straight piece is going to be trouble. So with that in mind, I drew up Option 5, which is the 13th major redesign of the Aquia Line. Maybe it will be lucky 13. This plan has a lot going for it. First, it gets rid of the worst feature of the current Aquia Line - that is the tight 180 degree curve at Falmouth. There is now room for a 32 inch radius curve. It gives up the 10 feet of run along the wall where Falmouth currently is, but it gains about that much as it runs under the stairs. Moving Falmouth also lengthened the sidings so that the layout could now handle 8 or 9 car trains. There are other advantages of putting Falmouth in the crew lounge area. One it doubles the TT&TO pucker factor - operators leaving Falmouth for Stonemans Station and vice versa will not be able to see if the track is clear. So they will have to rely on their time tables and train orders to decide if it is clear to go. I already have that situation when leaving Aquia for Brooke, so this will double the fun. 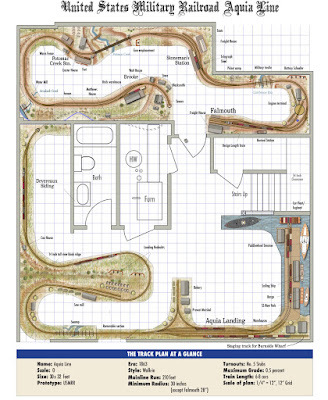 The other big advantage is that the layout could be built in manageable phases with little wasted effort, as Gerry alluded to in his comment to my earlier post. The Aquia Landing phase is ready to lay track, so that would come next. Once that is complete, I could remove PoLA and start building the Falmouth extension. Only when the Falmouth extension was ready, would I cut out the old Falmouth and tie it in. Since the benchwork at Aquia Landing is ready for track, the project becomes more manageable. Another plus is that there is no blocking the way to the office, so I could set up a dispatcher there and they would have access to the layout if necessary. Furthermore , I could lay a track across that gap for a continuous loop when desired. The main draw back of Option 5 is that the plan does not have as long a run as Option 4. I think the double pucker factor makes up for that. Runs in the closets can be "miles" long. 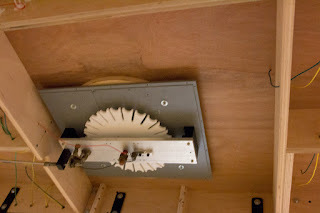 There is no turntable, but that is prototypical. 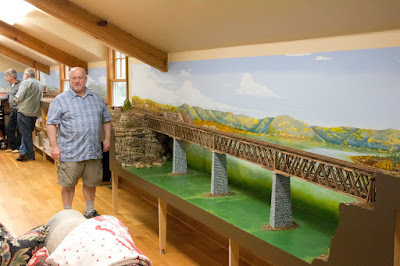 The USMRR planned but never built a wye at Falmouth, so a wye is more realistic. ...or "How Bernie Got His Landing Back. " A foggy sunrise at the front. One final photo before the WWI layout heads up to the B&O Museum. Dam Toomey and Travis Harry from the B&O Museum came by today to pick up the Battle of Cambrai WWI railroad diorama. The diorama is fully described in my book, "Model Railroads Go to War." 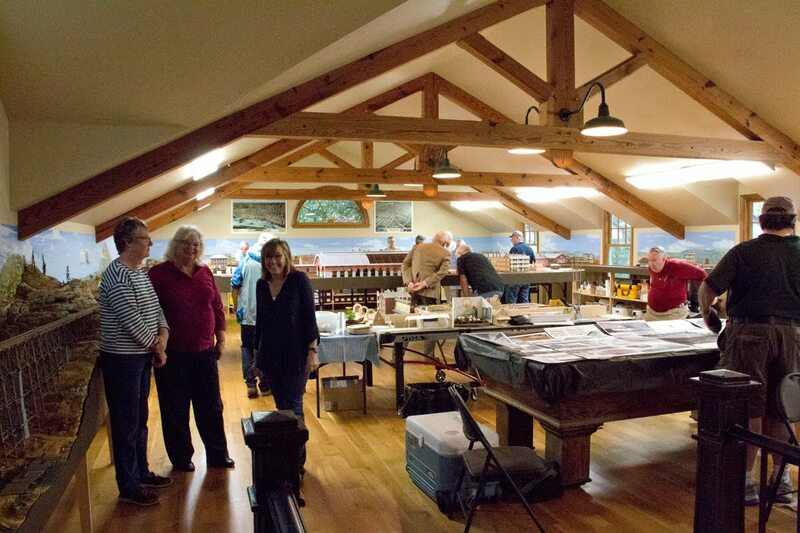 The diorama will be part of the B&O Museum display on the U.S. participation in WWI. The B&O Museum has one of the French friendship boxcars. Hopefully this diorama will help them enhance their exhibit. I am looking forward to seeing it on display. 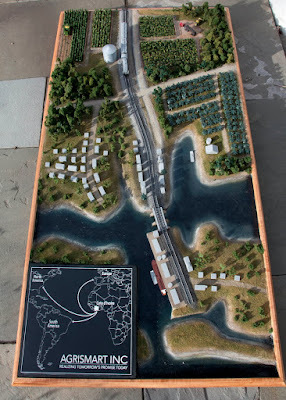 For the past couple of years the diorama occupied the flat portion of the Aquia Landing peninsula. Now that the diorama is on loan, I can start actively planning on building the next phase of the Aquia line. and she is much thinner than most of my RR friends. I took a piece of masonite and mocked up the fascia for a 30 inch loop. If I bump out only the north side of the peninsula, the aisle between the layout and the closet-bathroom has about 21 inch choke point. While the bump out doesn't interfere with the HVAC closet door that opens into the aisle, it does constrict movement. CINCHOUSE (aka Alicia) doesn't like it much. So we tried a mockup where each side of the peninsula is bumped, but each to a lesser amount. The seems to work much better. I mocked up a couple pieces of pink foam to create a view block representing the ridge. It looks like it should work. See the concept sketch below. The main drawback to this layout with the turn back loop and ridge is that to make the Aquia Landing landing fully functional, I would have to take out PoLA and build the Aquia wharf in its place. However, If I build the landing on the existing peninsula like in Option 1, then the USMRR and PoLA could coexist. So if I go with the Option 4 then what to do with PoLA is the next decision. I can foresee three possibilities: sell it off in whole or by parts, convert to a FREMO module set or build as a shelf layout in my office. Hmmm, it's good to have options. I have a few weeks to think about this as I have to finish up the custom model (which is nearly done and will be delivered this Saturday), and I finish the Borax factory on PoLA. 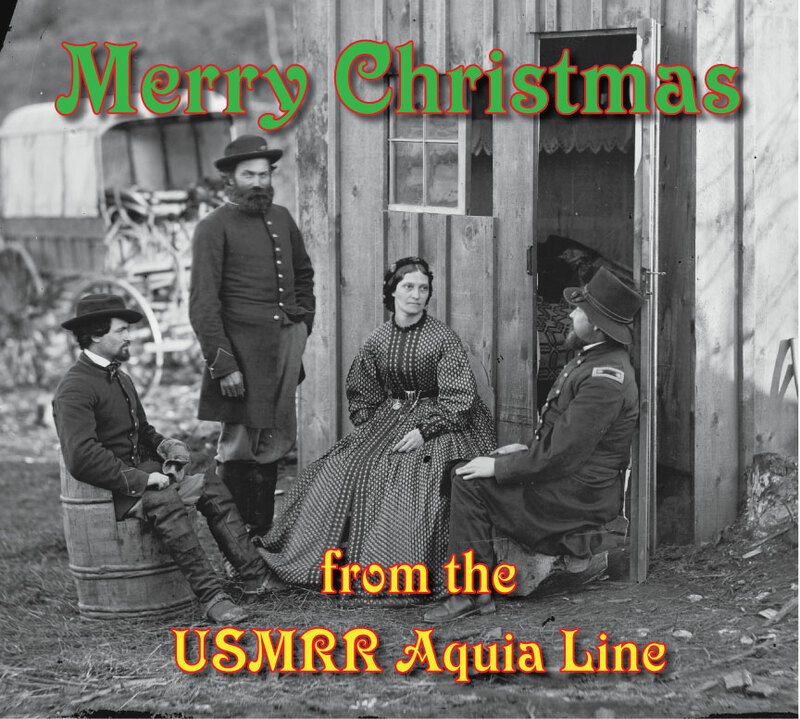 But it is good to start thinking about and start work on the Aquia Line again. Concept sketch of how the peninsula would look. The ridge is high enough to block my view across it. We hope you have a Merry Christmas and a Happy New Year. I am nearly finished with the custom model job, so soon it will be time to get back to work on finishing PoLA and starting the Aquia Line Phase II. The image below is a close up of the bluff behind Burnside's Wharf. This cliff is the inspiration for the central view block ridge in the new Aquia Line expansion. I think it will make an impressive scene. It also helps block the view of the work shop area from the pit near the home office. 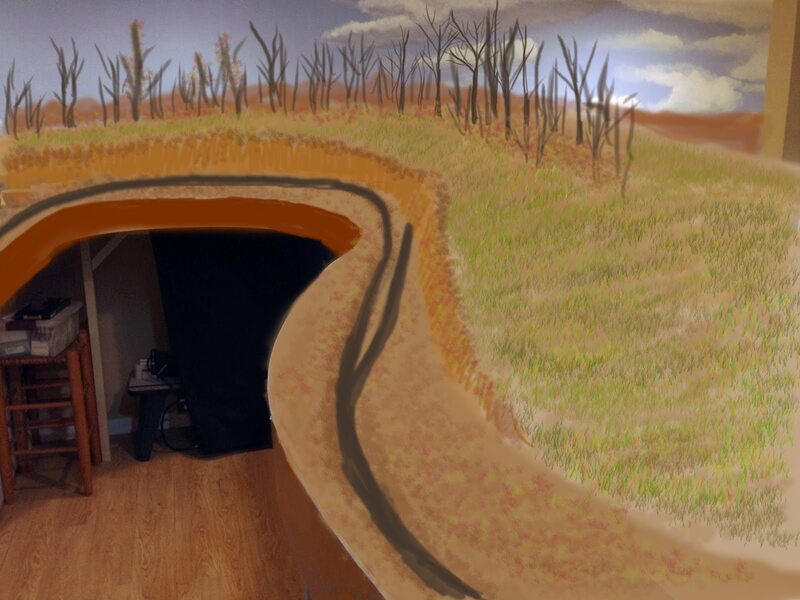 The idea of having a view blocking ridge here, as opposed to the flat harbor area, came to me when I temporarily moved the WWI diorama in this position to make space to work on the custom model. I noticed that the sky board on the WWI diorama blocked the view into the workshop area. This enhanced the scene, making the layout feel bigger. That's what motivated me to redesign the layout and move Aquia Landing to its new location where PoLA is now. 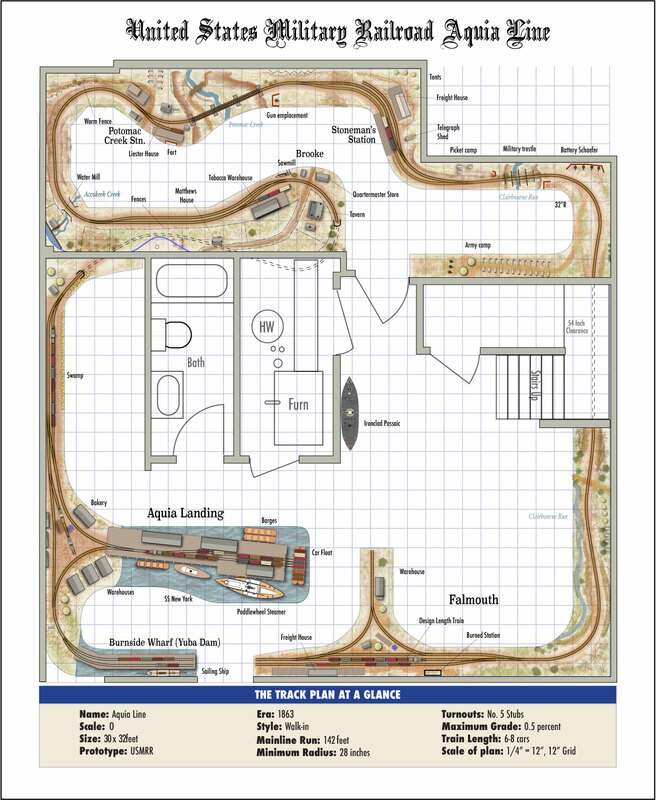 And as a Christmas present, here is yet another Aquia Line layout plan. This one extends the central peninsula at the expense of deleting the wye. It adds a turntable to spin the engine. I think the plan with the wye is better as I really like how it operates. But this one has merit too. Yes, it's Pinewood Derby time. That usually means the kids in my neighborhood come over to use my tools to help build their cars. This evening Sean and his son, William, came by to use the drill press and look at the layout. We got the holes drilled without too much trouble. 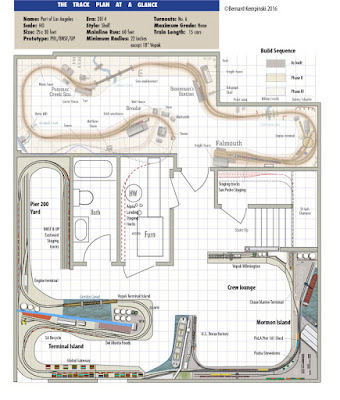 Then 8-year old William, took a look at the layout. He had to use a step stool, but he got a good look at the layout. We ran some locos too. Oh yeah, it's also Christmas season. So earlier in the day, Lance Mindheim hosted a holiday open house. Paul Dolkos and I drove up to Maryland to partake. We got to see Lance's awesome layouts, including a massive N scale layout he is building for a client. That layout features the Cowan Subdivision on the CSX (formerly L&N and N&C before that). 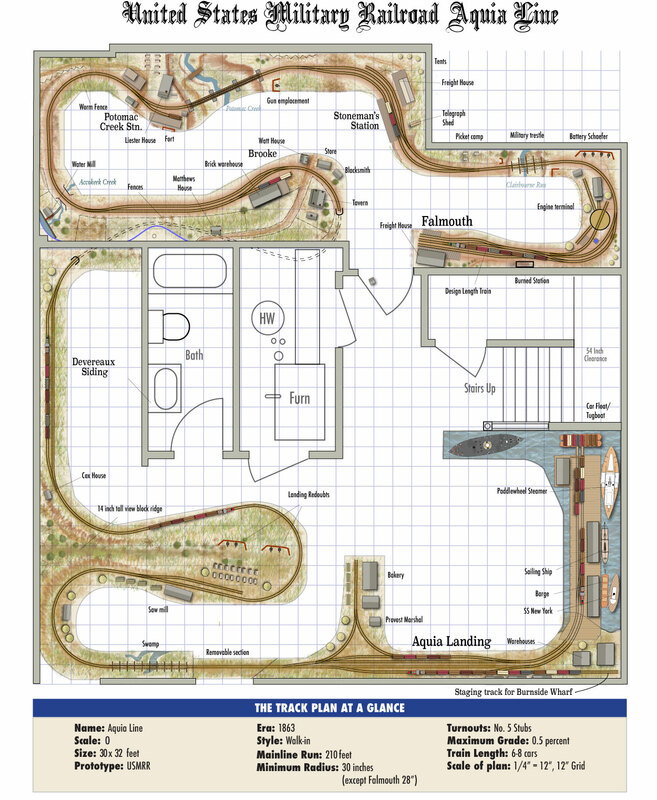 I did a layout design of that prototype, also in N Scale, in my latest published book, "45 Track Plans." Lance's layout and my design shared a lot of common ideas. 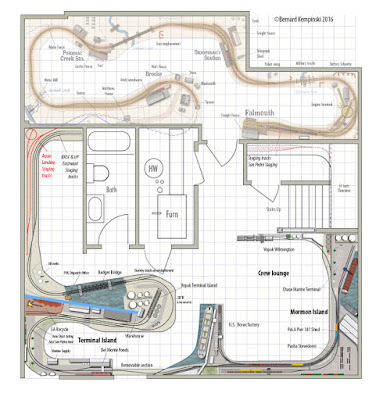 It's also track planning time of the year. (OK, I just made that up. It's always track planning time). This latest idea, Option 4 is a maximum scope Aquia Line. 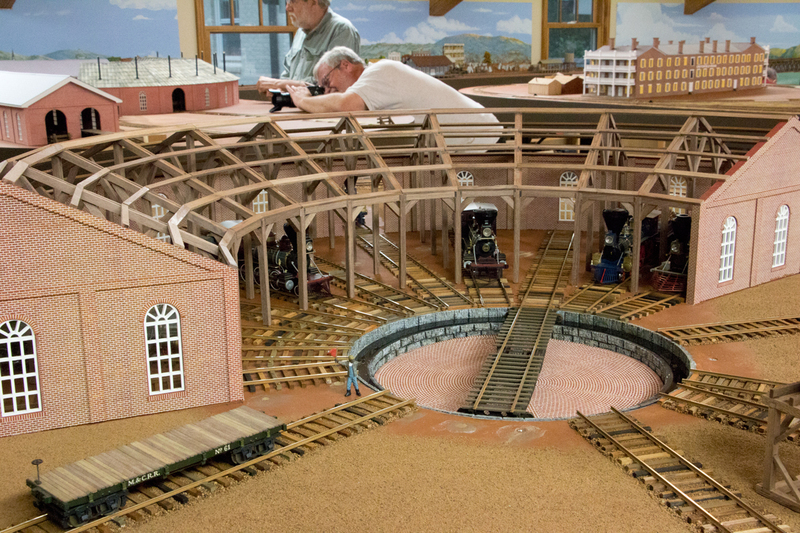 It just about doubles the Aquia Line man line run at the expense of omitting Burnside wharf, which is now just modeled as a staging track behind Aquia. Of all the plans I have been looking at, this one is appealing to me the most. The longer main line across two rooms really makes TT&TO operations more interesting. This layout also scored the highest of any layout plan I looked at on the matrix. See below. 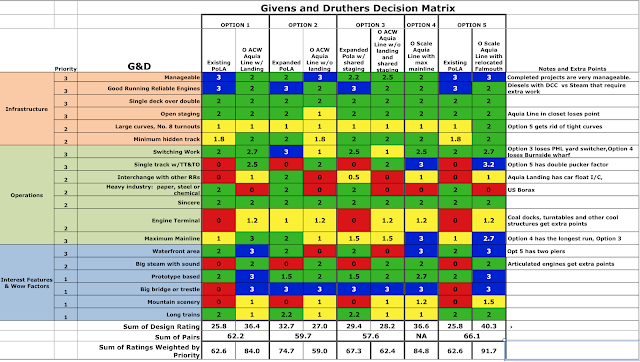 This matrix is a little different because Option 4 is only one layout, not a pair. So you can't compare sum of pairs scores. But Option 4 scored the highest of any single layout I looked at. However, Option 1 also scored highly. You'll also note that this scoring systems two digit decimal and not just integer scores. 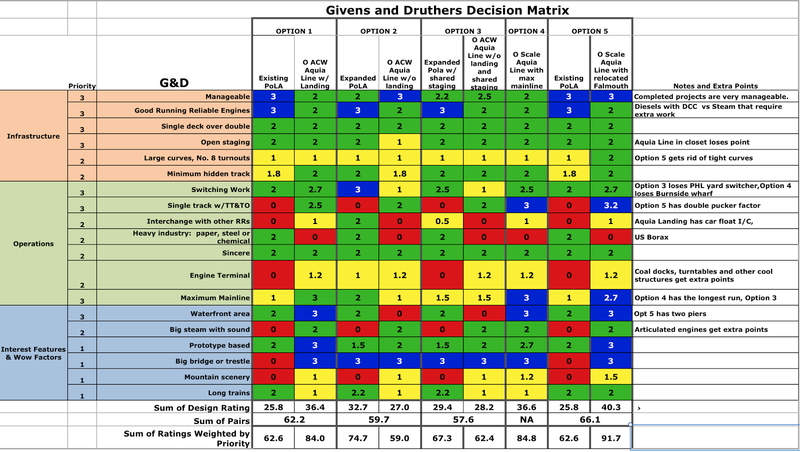 This was based on a suggestion by Roger Sekera to allow more differentiation between similar but different ratings. 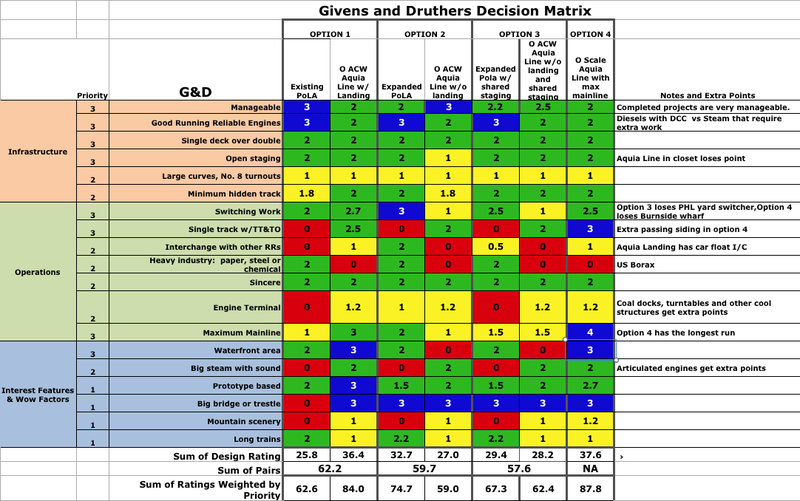 I tried a ranking of options system, but that did not work. I also tweaked the score for maximum mainline as this one is the longest mainline run I have looked at. 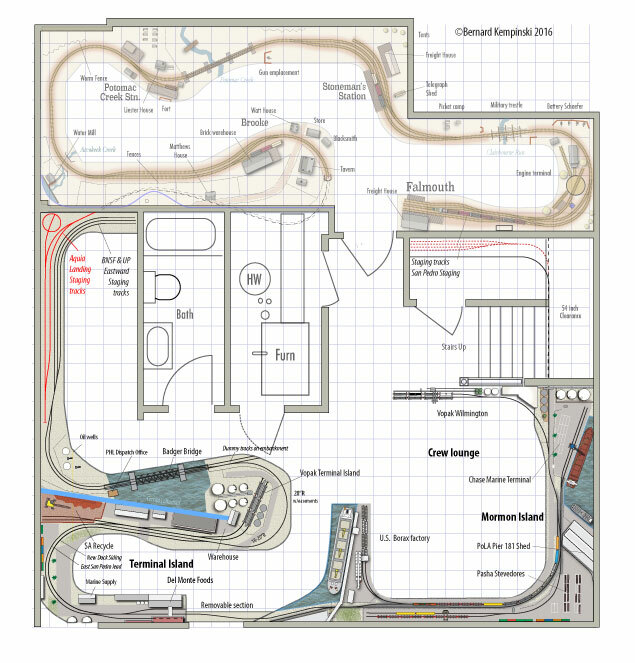 For completeness sake, here is layout option 3. This one is an interim design that uses a shared staging concept. By doing this, Aquia's Line staging is much more user friendly, but the PoLA layout loses the yard jobs. Thus the design is basically my current PoLA times 2. It creates two mediocre layouts. Option 4 is one outstanding layout. It can take 4-6 operators, plus a dispatcher. I recently started a new custom model project for a client. It is due in 3 weeks, so I am cranking on it. I'll post some pictures of it when I get further along. It is a different kind of model that I am used to, so I am curious on how it will come out. So while the paint and stain on that project are drying, I got to tinkering with track plans for layouts in the rest of my basement. 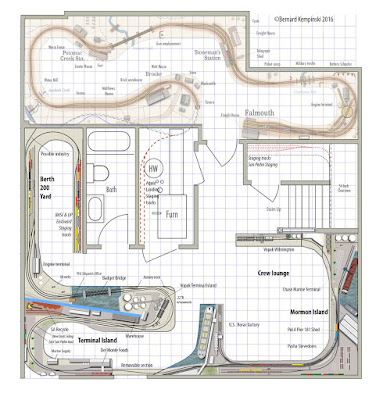 This particular bout of track plan frenzy is due to a discussion I had with Henry Freeman last weekend. He was in town for a symposium at the Newseum, as he is retired, well-known newspaper editor and publisher. He stopped by the house to operate PoLA. Unfortunately, my DCC system decided to act up during the session. Both of my RF1300 throttles died in the middle of the session. I was able to get one of the new T1300 throttles in service, but by then the evening devolved into a layout planning session. Henry is a serious model railroad operator who leans to preferring layouts with heavy ops more than scenery. In his eyes, the Aquia Line is nice to look at, but lacks in play value. After he left, I toyed with some plans that would increase operation potential in my basement by expanding PoLA into the rest of the unfinished basement, leaving the section of the Aquia Line from Brooke to Falmouth intact. The first plan I drew included an attempt to model one of the container terminals on PoLA (see upper plan at left). This was really a force as trying to fit in even a small container terminal in the space I have available was tough. In addition, the need to buy several sets of double stack cars, associated motive power, and containers would add nearly $3,000 to the cost of the layout. As I discussed this rough idea with some friends, I realized that the container trains add very little play value to the layout, especially given their expense. 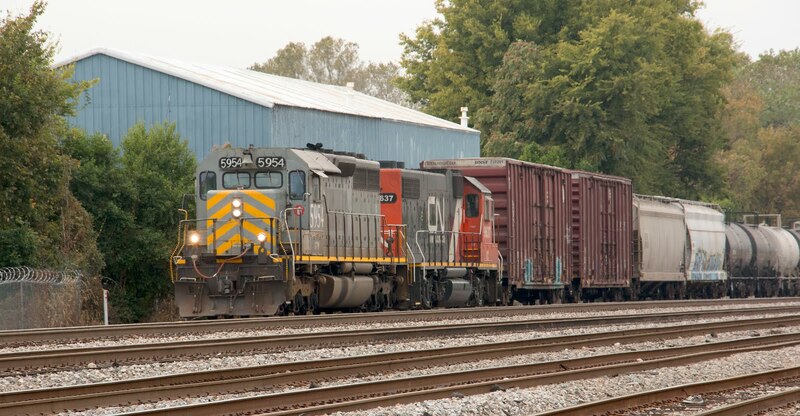 Even when we railfan, my friends are wont to say upon seeing a stack train, "Oh, It's just boxes." 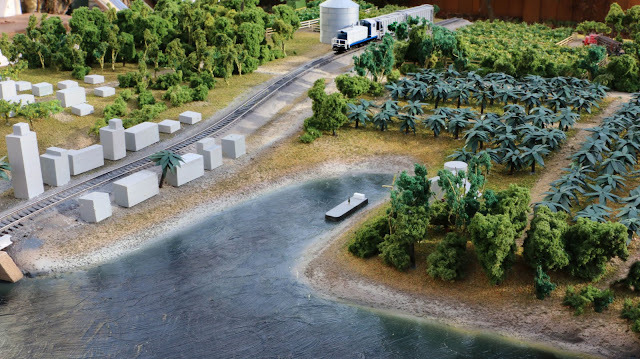 The question is, can a layout that omits container traffic be an accurate model of PoLA? I say why not. Instead of actively modeling container terminals and container trains, the layout depicts them as images on the backdrop. 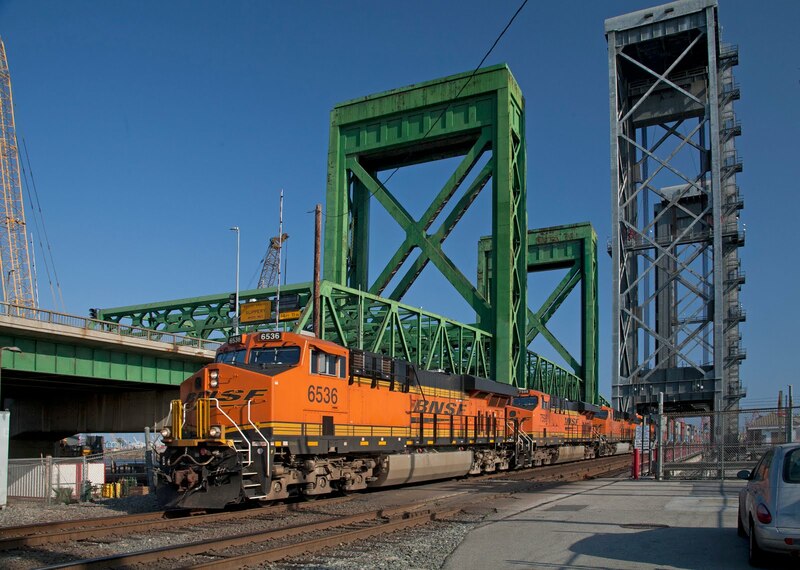 Without container traffic, the layout focuses on the 40,000 non-container cars that PHL handles each year (compared to 1.2 million double stack container cars per year). That is the next plan you see at the left. This plan includes a compressed rendition of PHL Berth 200 yard, and several industries on Terminal Island that require rail service but are not container based. It includes a scrap metal facility, since scrap is one of the largest US export products and there are two scrap piers on Terminal Island. It also includes a second Vopak facility, a Del Monte Foods factory (which may no longer get rail service) and one additional warehouse that is freelanced. The plan includes a near scale sized model of the Badger Ave Bridge, which was once a pair of rolling lift bascule bridges, but is now a large vertical lift bridge. That would be a signature scene on the plan. The plan connects the Berth 200 yard to Mormon Island, but from the "wrong" direction. Not much I can do about that. 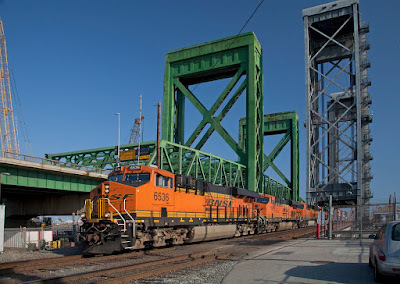 However, the staging tracks in the closet can now represent the Sen Pedro district thereby creating a transfer run job from Berth 200 yard to San Pedro. I looked at a escape track through the peninsula backdrop that connected Mormon Island to Berth 200 without crossing the Badger Ave Bridge (see the upper plan), but decided to remove it in the interest of simplicity. Other jobs out of Berth 200 yard include the Terminal Island Dock Switcher and the Mormon Island Dock Switcher. The Terminal Island job and the Mormon Island job would be ready to leave Berth 200 at the start of the op session. 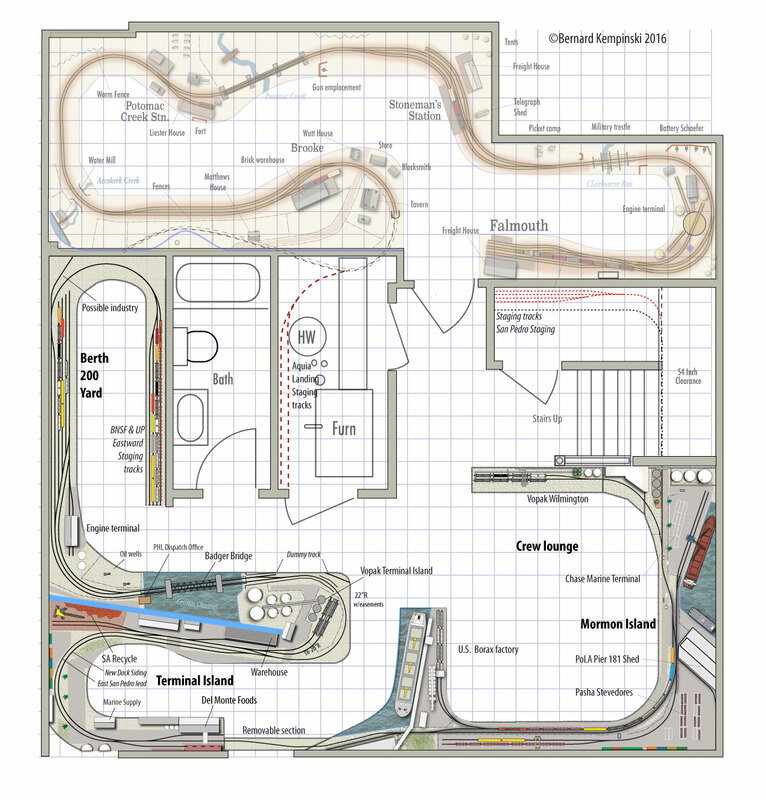 During the session the Berth 200 yard would get transfer runs from staging. Then the yard crew would make the trains for the next session. 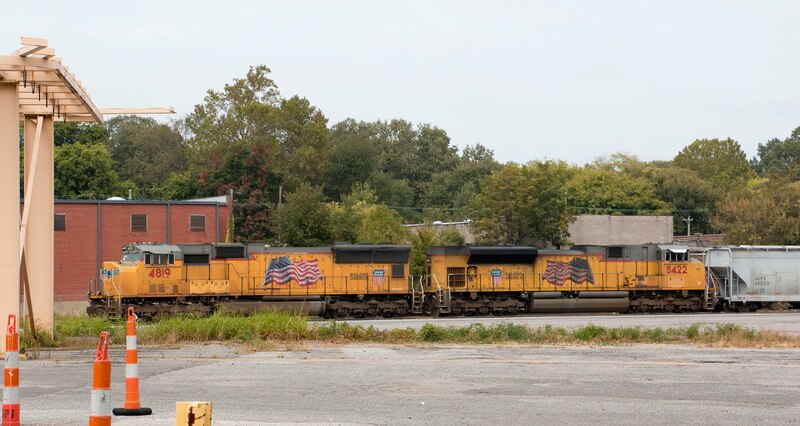 In addition to the two Dock Jobs mentioned above, the yard could create extra jobs that include a slab train for Pasha, and military trains, wind mills and transformer loads for CMT. Right now wind mill and transformer cars have trouble with the tight curve in the under-stairs staging track. Keeping them away from that area would be good. So what to do? I envision two Options. Option 1 is to build Aquia Landing as planned, keeping the Mormon Island layout as is, at least for a few years. Option 2 is to Expand PoLA into the place where Aquia Landing would have been, leaving USMRR intact from Brooke to Falmouth. To maintain operational capability on the USMRR I would add a simple staging track in the HVAC closet. Both options appeal to me. 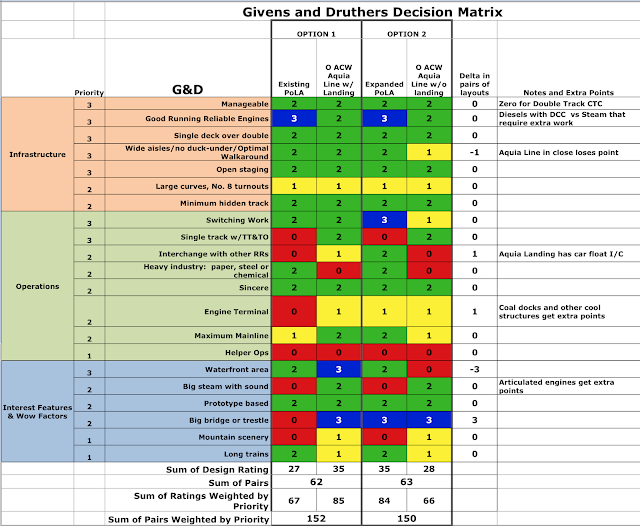 To better understand the options I made a G&D Decision Matrix. 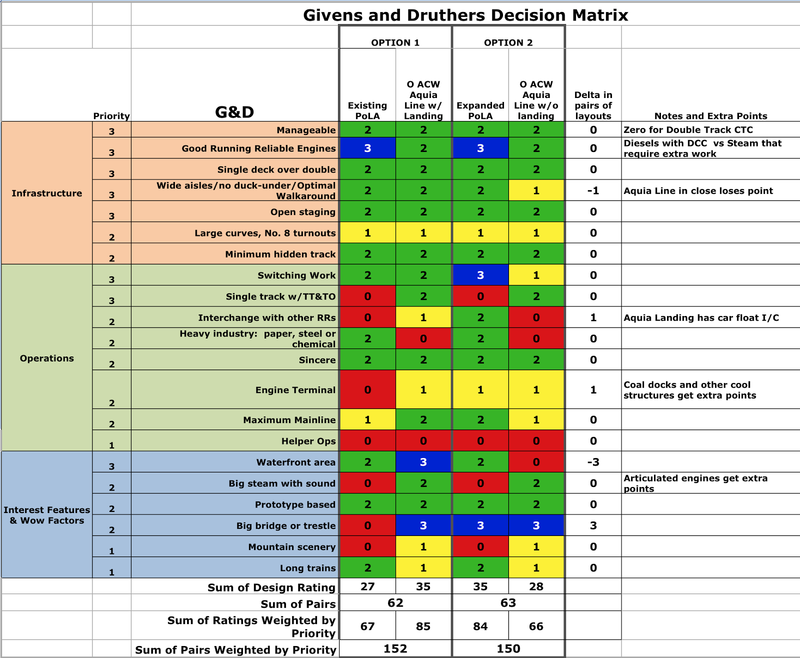 This is a bit different from previous analyses I have done because now the matrix compares the scores from two pairs of layouts instead of each layout as a standalone. A couple things pop out from inspecting the matrix. One, the two options are very close in sum of scores, with Option 2 just barely edging out Option 1. 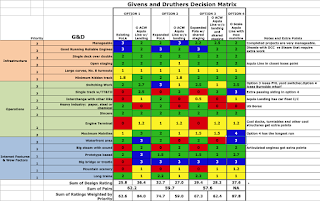 However, Option 1 wins when considering the sum of scores with weighted priorities. The main discriminating differences between the two pairs of layouts are the better waterfront area in Option 1, compared to the extra bridge in Option 2. Interestingly, the enhanced operations of the expanded PoLA layout are somewhat cancelled by the reduced operational options offered by the smaller USMRR. Option 2 gets extra points for having an interchange with more than one RR, and an engine terminal, but loses a point for awkward staging in the HVAC closet. The rest of the factors wash out as one layout gains what the other loses. So the analytics don't point to a clear answer. What does emotion say? Alicia says Aquia Landing has more cool factor, but she has no real preference either way. I suspect that expanded PoLA could be put into service faster than Aquia Landing since one uses commercial track, while the other must be hand laid. The ships on Aquia Landing will also take some time. Anyway, I'll have plenty of time to cogitate on the course of action as I finish up the custom job before Christmas. This evening Steven Wilson from the Abraham Lincoln Library and Museum at the Lincoln Memorial University Library in Harrogate, TN, stopped by to visit the layout and pick up some of my dioramas. The dioramas will be on display for the next two years at the museum as part of a new exhibit on technology in the Civil War. I'll post more information about the display when it is ready in a few months. While Steve was visiting, we ran a few trains to demonstrate the Aquia Line layout. Steve is not a model railroader, so he had a lot of questions about the hobby. Last week my brother and his wife visited us from their home in Florida. We played a lot of golf and ate lots of good food. Nonetheless, I managed to get in about 15 minutes of rail fanning as the Whiskey Creek Golf Course is adjacent to the B&O Old Main Line near Ijmansville, MD. I had a few minutes to railfan and got this shot of a coal drag heading to Texas at the BNSF yard in Denver.. The three hooligans on Top Gear are not the only guys doing the grand tour this month. In the past two weeks I visited 6 layouts in two states a thousand miles apart. The tour started in Denver where Alicia, Danica, Adam, and I visited three great layouts in the Metro area. They were Pat Lana's N Scale Crandic, John Parker's BNSF Fall River Division and Jim Frenec's Colorado Southern. All there were great layouts with gracious hosts. We had a chance to meet Pat's operating group and have lunch with them. At John and Jim's layouts, the layouts were not being operated, but they were kind enough to give us a detailed tour. One thing is sure, they have some great layouts in the Denver area. I look forward for a chance to operate some of them. Later in that weekend I had a few moments to railfan while having lunch at the Blue Moon Brewery. 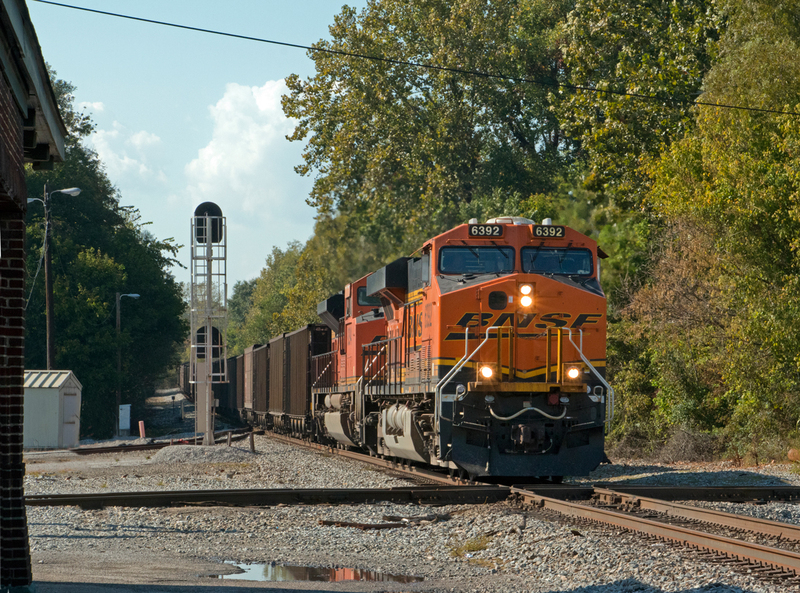 I was just in time to see a BNSF west bound coal drag. After a short week home, I traveled to western New Jersey with Paul Dolkos to operate on some great layouts as part of the Northeast Interchange (an informal group of layout operators that alternate round robin op sessions in NJ and DC-MD each year). 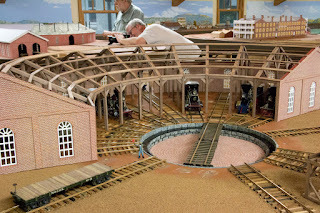 The first was Ted Pamperin's wonderful C&O New River Subdivision layout. I got to run a H-4 2-6-6-2 Helper to Alleghany and back to Hinton. This involved the classic dance at Alleghany with shuffling the caboose and turning the engine all under CTC control. Then I ran an H-7 2-8-8-2 with a train load of armored vehicles (see video). That was a treat. Ted's layout is chock full of wonderful steam engines and great scenery. The next day I operated on Dave Abeles's Conrail Onondaga Subdivision. 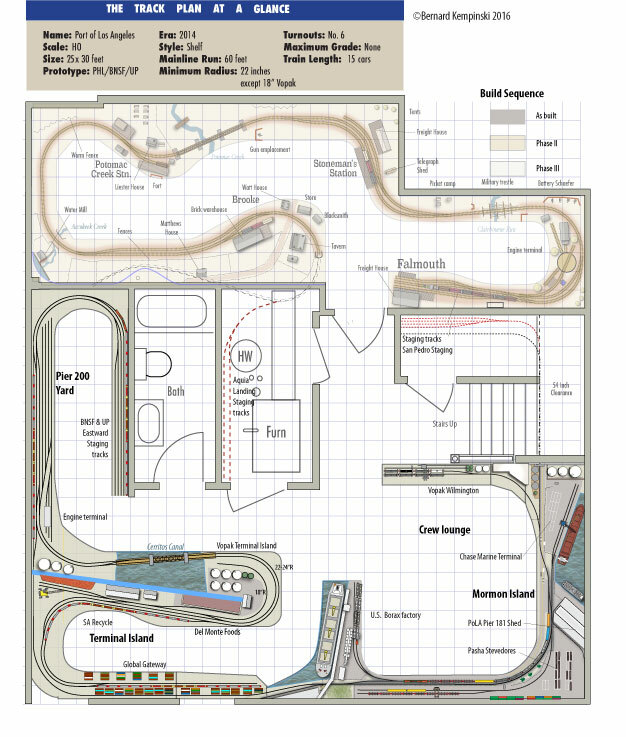 This layout aims to capture the feeling of high volume and high-speed operations on Conrail in the 1990's. Dave and all his helper crew are professional railroaders on NJT, LIRR, or AMTRAK in various capacities. They are also a young group and have embraced all kinds of modern technology such as wifi throttles, remote dispatching (the dispatcher in the first half of the session was located in Philadelphia), full bi-directional CTC on a double track main, photo printed backdrops, and night time operations. It was an intense and fun session. I got to dispatch in the afternoon with lots of help from Chris Lee. On the last day I operated on Jerry Dzeidic's Susquehanna RR. It is a large double deck TT&TO layout. While there is little scenery, what is complete is well done and the unfinished sections are neat and well built. The layout ran great. Travis Stavac and I ran a way freight that was a lot of fun. Through a blunder on our part, we managed to create a "first"- a three way meet at Sparta Junction. I guess Jerry's warning during the morning briefing to "not meet at Sparta" fell on deaf ears. It was a fun weekend punctuated by the first snow fall of the year. Weekends like these reinforce what a great hobby with great people we have. Paul helps clear the first snow off the Alkem-mobile while still on summer tires. Luckily the temps were warm and the snow quickly melted. The Tracks to the Triangle MER annual meet is drawing to a close. It was an extremely well run event and I had a great time. I want to thank Jack Dziadul and his crew for inviting me, and providing great support during the meet. Lou Sassi host an open house for his beautiful On30 layout. I got to tour four layouts, attended several clinics, and presented 3 clinics myself. I also did the key note talk at the awards banquet. Unfortunately, throughout the weekend I suffered from a severe case of Laryngitis. In spite of my sore throat and weak voice, using a microphone I was able to get through all my presentations. I am looking forward to next year's event in Harrisburg, PA. I also learned that in 2018, the Potomac Division will be hosting the meet in the DC area. I better get cracking on getting the Aquia Line up and running before then. 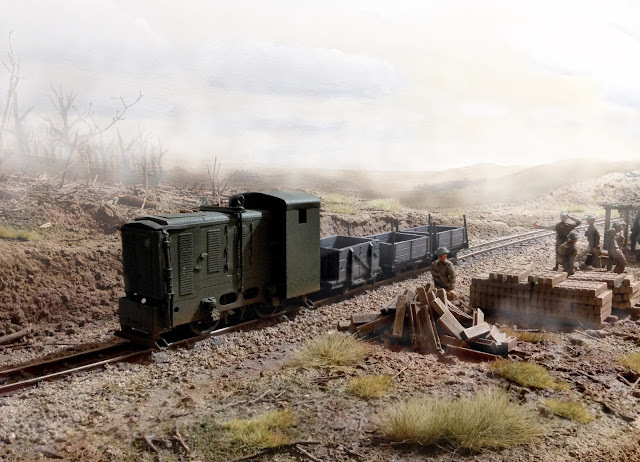 Coal mine scene on Will Allen's layout. In my previous post I failed to mention that Dave Schneider of SMR trains announced a bunch of new products in O and HO scale. Dave Bright also announced a new book he has written on the Confederate's capturing and transporting locomotives and cars from the B&O and ALH RR's. SMR Trains has some of the products already posted on his website. Others will be forthcoming. The first products for sale are laser cut O scale box cars in kit or RTR form. See the image below. Next on tap are O scale figures, tools, artillery, and other impedimenta. He also showed the prototype for models of the Lee-Brooke Gun in O and HO scale. Dave Bright's new book will be out in a few months. It is a detailed look the facts behind the great locomotive caper and Thomas Sharp's role in it. Check his web site for more details. Wow, what a great meet. The guys in Tennessee really put on a wonderful event. Special thanks go to Charlie and Ginger Taylor, Thom Radice, Harold Taylor, Charlie Curro, Lee Millar and all the others that did presentations or brought models to display. The official meet started with talks at the hotel on Thursday evening. 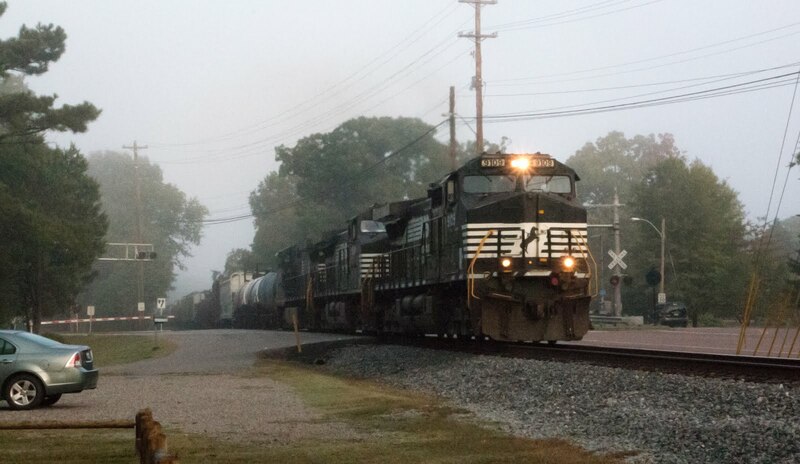 However, I managed to do some rail fanning on Thursday morning in Arkansas and Memphis. I saw a double stack train east bound as I crossed the Mississippi, and a coal train westbound, but couldn't get photos. Later I chased a mixed freight east through Memphis. Large scale model of Sultana in the museum. On Friday morning the attendees went in small groups to local museums or activities. I went with Don and Becky Ball to see the Sultana Disaster Museum in Marion, Arkansas. It was a major tragedy that is little known. It is still the greatest nautical disaster in terms of loss of life in American history. Friday afternoon was the highlight of the trip as we got to tour and operate Charlie Taylor's huge O scale Memphis and Charleston layout. Thom Radice helped Charlie set up an operating session that allowed all of the attendees that wanted to, to operate trains. I was an engineer teamed with my conductor Ron Flowers to run the Nitre (basical ly bat guano from a mine in a cave - how appropriate) train from Huntsville to Chattanooga and back. The run took all afternoon, as we had request for numerous photo run bys and meets with other trains. 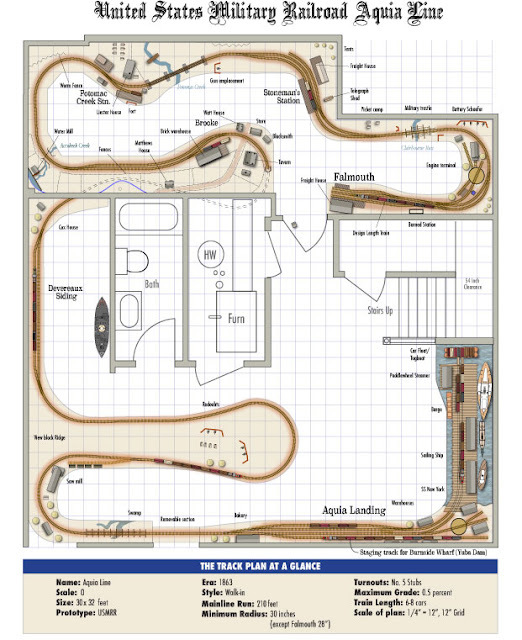 Charlie's layout is set in a 75 by 35 foot loft above his large garage and guest house. It is a wonderful space for a large model railroad. His engines use DCC and sound. The layout includes two turntables with a unique mechanism based on a "Geneva Wheel" that allows for automatic indexing. They were designed and built by Charlie's brother Harold, a mechanical engineering whiz. Before dinner Harold took me for a tour of his machine shop. It was fully equipped with a multi head CNC mill and several other industrial grade lathes, brakes, and grinders. one of two huge bridges on the layout. In keeping with the family affair, Charlie's nephew, Will, painted the backdrops and his 90-year old mother built many of the smaller structures on the layout. Charlie Curro, a long time colleague of Charlie Taylor, built most of the big structures. 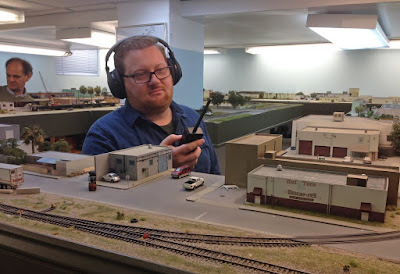 It was a delightful experience for me to operate on another ACW O scale railroad. Dave Schneider, owner of SMR trains, told me that we (Charlie Taylor and I) are the only two layouts he knows that actually operate his O scale engines. The "Charlies" and I compared notes on techniques and tips. Charlie uses Digitrax DCC with Tsunami sound decoders. They sounded quite good and ran great. His cars use link and pin couplers. After a genuine Memphis BBQ dinner, we had more talks back at the hotel. On Saturday, we went by bus to Shiloh Battlefield National Park. The park includes Corinth and Battery Robinette. Lee Millar, as a CSA Captain, lead the tour. First we stopped in Germantown to examine a 19th century boxcar hidden in a storage shed. Once at Shiloh, he gave many of us a chance to load and fire blanks with a musket, showed us the key points on the battlefield, and told a bunch of groan-inducing jokes, usually with a unreconstructed rebel theme. The Shiloh Battlefield is about what I expected in terms of gently rolling and wooded terrain. However, I was surprised at the small size of the final position of Grant's lines on the first day. I expected them to be a bit larger. They really where crammed in between the creek and the river. Overall the battlefield is well preserved and undeveloped. The woods were allegedly not as thick then as they are now, but the open fields are very similar to the way they were in 1862. The crossing at Corinth was interesting, even if all the ACW era stuff is mostly gone except for the location of the tracks. 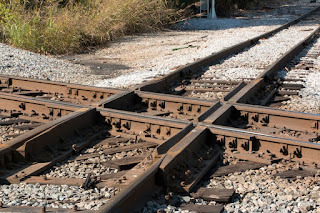 The crossing diamond uses an continuous track for the Norfolk Southern east-west line. The north-south line has guard rails as the wheels have to "jump" the East-west rails- at slow speed I imagine. On Saturday night we had a couple of presentations on the ACW TTRAK. 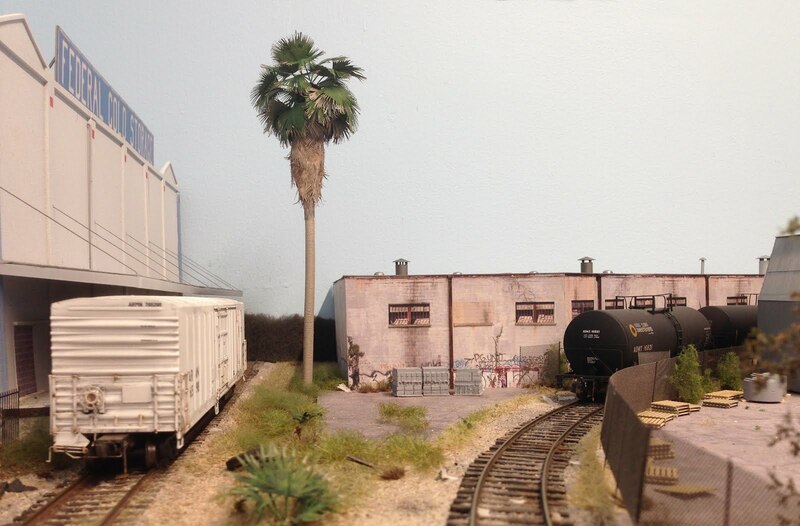 Joel Salmons set up a small layout and ran some trains. This was one of the best ACW meets that I have attended (I haven't been to all of them). I am looking forward to next year. Martinsburg-Harpers Ferry and Antietam might be a possible location. Maybe with a new TTRAK module and hosting an op session on the Aquia Line. From Nortraks website. One-Way Low-Speed diamond frogs are used in their namesake diamonds, often referred to as OWLS diamonds. These types of frogs are analogous to lift frogs in turnouts: the higher-trafficked line crosses the diamond on a normal rail surface in tread-bearing mode, and the lower-trafficked line crosses over the higher-trafficked line in flange-bearing mode. Because there is no flangeway gap to cross on the higher-trafficked line, vehicles using this line can cross the diamonds at the maximum speed allowed by the track design. Because the lower-trafficked line is in a situation where gauge restraint is reduced and because it has to cross over the flangeway gap for the higher-trafficked line, vehicles using this line are limited to speeds at or below 10 miles per hour. OWLS diamonds are commonly used where a rail line with very little traffic operating at low speed crosses a rail line with considerably more traffic operating at higher speeds.